Bird protection is of course a long-time concern of nature conservation. Bird protection associations date back to the late nineteenth century. In the wake of Rachel Carson’s Silent Spring (1962) and the rise of modern environmentalism since the 1960s, people in Europe started worrying that migratory birds would go extinct. Media in northern Europe blamed the cruel and ruthless hunting practiced in southern Europe, notably Italy. 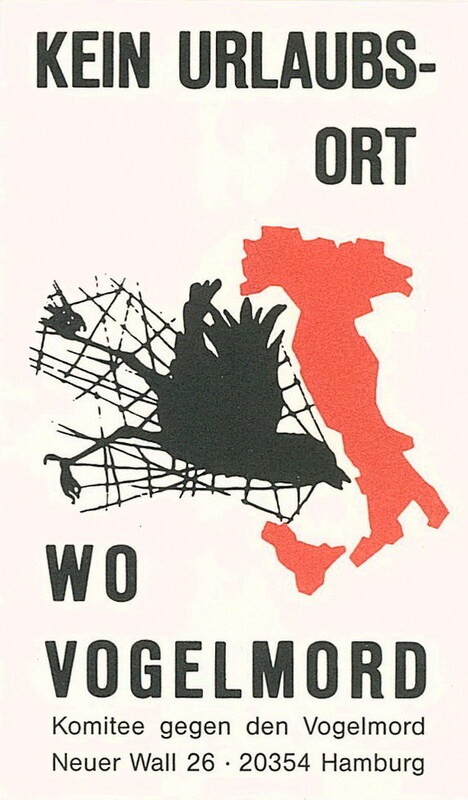 The radical bird protection activist group Komitee gegen den Vogelmord, cooperated with Italian activists on a boycott campaign against tourism in Italy. Against this backdrop transnational cooperation among bird protection activists played a crucial role in turning the cross-border problem of migratory birds into an issue of supranational European legislation. However, in spite of the ornithological expertise of the older, well-established bird protection associations, including the Royal Society for the Protection of Birds (RSPB) or the Deutscher Bund für Vogelschutz (DBV, today Naturschutzbund Deutschland, NaBu), they were not the ones who placed the issue firmly on the agenda of the EC. Rather, it was groups that were much more radical with regard to their ideas and actions. Motivated by deep ecological ideas, the Dutch Stichting Mondiaal Alternatief (Foundation for Ecodevelopment)—supported, among others, by the German Committee against Bird Slaughter (Komitee gegen den Vogelmord), which had emerged from the animal protection movement—submitted a petition “Red de trekvogels / Save the Migratory Birds” to the EC institutions in 1975. This got the ball rolling. To be sure, members of the—then powerless and unelected—European Parliament (EP) had raised the issue before in parliamentary debates since the late 1960s. When the EC started its first environmental action program in 1973, bird protection was part of the agenda, albeit as an issue of research and international cooperation, not of legislation. However, the vice-chair of the EP’s environmental committee Hans Edgar Jahn, a German Christian Democrat, grasped the opportunity the petition offered to him, and prepared a parliamentary motion calling upon the European Commission to propose binding EC legislation to protect Europe’s birds. 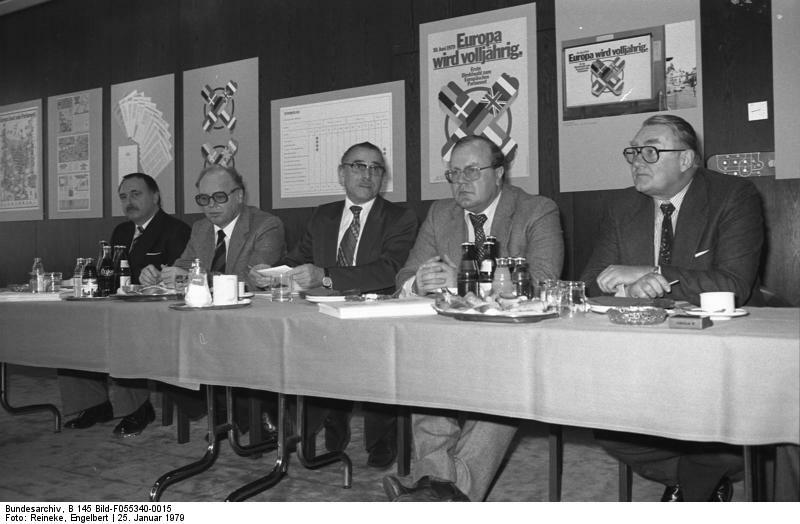 1979 Engelbert Reineke, Bundesarchiv, B 145 Bild-F055340-0015. Subsequently Jahn started cooperating with an emerging European network of bird and nature protection activists. This included Germany’s most prominent environmentalist, TV host and director of the Frankfurt Zoo Bernhard Grzimek, as well as Italian bird protection groups. They bombarded the European Commission with letters calling for common European rules. And indeed, in 1976 the Commission proposed legislation, having consulted not only Grzimek, but also experts from the traditional bird-protection groups, notably the RSPB, on what to include in the draft. “Have a heart for birds. 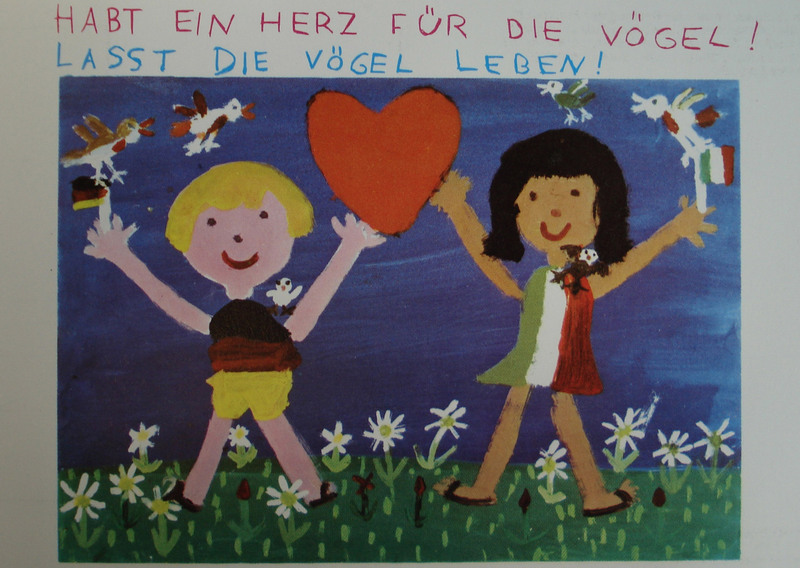 Let the birds live!” proclaims a postcard distributed by Komitee gegen den Vogelmord. Their fund-raising campaign featured children’s drawings and the plea “prevent a ‘Silent Spring’” (printed on the back). As the French and Italian governments—under pressure from the hunting groups—fiercely resisted the proposed directive, and delayed its enactment, bird protection groups engaged in comprehensive letter-writing campaigns. They targeted national governments at home and, in particular, the reluctant French and Italian ministers. The European Environmental Bureau—founded in 1974 as the umbrella organization of European environmentalists—helped to coordinate their campaigns. The older bird protection associations however eventually established their own Working Group of European Bird Protection Societies (WEBS). Building on earlier cooperation within the International Council of Bird Protection (ICBP), it laid the foundations for their European association, Birdlife Europe, which was founded in the 1990s. When the directive was finally enacted after much haggling and compromising, the bird protection movement had become pan-European—much like the birds themselves. Meyer, Jan-Henrik. “How Birds Became Europeans: Bird Protection Activists Cooperating across Borders for Supranational Protection.” Environment & Society Portal, Arcadia (2013), no. 20. Rachel Carson Center for Environment and Society. https://doi.org/10.5282/rcc/5652. Meyer, Jan-Henrik. “Saving Migrants: A Transnational Network supporting Supranational Bird Protection Policy in the 1970s.” In Transnational Networks in Regional Integration: Governing Europe 1945–83, edited by W. Kaiser, B. Leucht, and M. Gehler, 176–98. Basingstoke: Palgrave, 2010. Meyer, Jan-Henrik. “A Good European? Hans Edgar Jahn—Anti-Bolshevist, Cold-Warrior, Environmentalist.” In Living Political Biography: Narrating 20th Century European Lives, edited by A.-C. L. Knudsen and K. Gram-Skjoldager, 137–59. Aarhus: Aarhus University Press, 2012. Jan-Henrik Meyer is a postdoctoral researcher at Aarhus University, Denmark. His research interests relate to the international emergence of environmentalism and environmental policy since the 1960s. A former fellow at the Rachel Carson Center, Meyer is currently working on a project that seeks to explain the rise of environmental policy making within the European Communities. Together with Astrid M. Kirchhof, Meyer founded and organizes the Berlin Brandenburg Colloquium for Environmental History.